The family of a man who was found dead in a harbour's waters 22 years ago have expressed fresh frustration at the handling of the case. Kevin Mcleod's family believe he was murdered and have criticised how his death was dealt with in the past. They have raised concerns about what they regard as a lack of action on recent "witness claims" and a review of the investigation into Kevin's death. The Crown Office said the family were being kept up to date on developments. 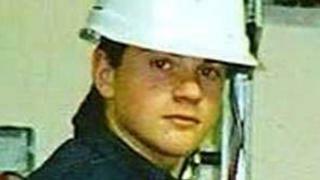 Mr Mcleod, a 24-year-old electrician from Wick, was last seen alive in the early hours of 8 February 1997 while on a night out with friends in the Caithness town. His body was recovered from the sea the following day. Mr Mcleod's parents, June and Hugh Mcleod, have received apologies from the police for how the investigation was handled at the time, and also the responses they had received to complaints about the probe. Mr Mcleod's uncle, Allan Mcleod, has told BBC Scotland News online of the family's fresh frustration with the case. He said it was now almost six months since police had submitted information to the Crown Office and Procurator Fiscal Service (COPFS) regarding a potential witness's claims made in January last year. It is also almost a year ago since the Lord Advocate instructed an independent review of police handling of Mr Mcleod's death. Allan Mcleod said: "After 22 years the family's nightmare for answers continues with the authorities again dragging their heels." He said he and the rest of the family wanted to know if any arrests are to be made. A Crown Office spokesman said: "The Lord Advocate has instructed the Criminal Allegations Against the Police Division of COPFS to independently review the investigation carried out following the death of Kevin McLeod in February 1997, with a view to considering whether or not any further inquiries would be appropriate. "The family continue to be kept up to date at regular intervals with any significant developments." Police Scotland said: "This is a matter for COPFS."